AHS broke ground for the Chez Family Foundation Center for Wounded Veterans in Higher Education on November 8. Read more about the groundbreaking. Hillary Klonoff-Cohen is the first Saul J. Morse and Anne B. Morgan Professor in Applied Health Sciences. Read more about the the ceremony. Dr. Richard Schroth and Dr. Parviz Parhami were honored by the college for their professional and personal achievements. Read more about the distinguished alumni. Many new scholars joined the ranks of our tenure-track faculty. Read about our new faculty. Dr. Kim Graber and Dr. Jeff Woods were named Fellows of the National Academy of Kinesiology in September. Read about NAK. 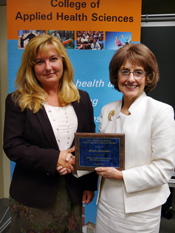 Monika Stodolska, a professor in the Department of Recreation, Sport and Tourism, is the 2013 King James McCristal Distinguished Scholar in the College of Applied Health Sciences. Read about the McCristal Scholar. We welcomed more than 300 new students to AHS in August. View our new student photo gallery. 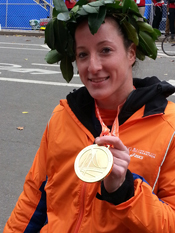 Paralympic medal winner Tatyana McFadden has won gold in the wheelchair divisions of four major marathons this year—London, Chicago, Boston, and New York. Read about McFadden. About 150 students from across the College of Applied Health Sciences learned about career options in the leisure industry during the 10th annual Sapora Institute, sponsored by the Department of Recreation, Sport and Tourism. Read about the the Sapora Institute. 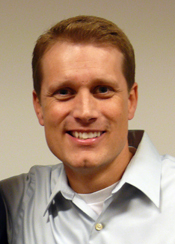 Dr. Ryan Gower is the Interim Associate Dean for Undergraduate Affairs. Read about Dr. Gower.